Relations of Joseph and Judah. The departure, under the leadership of Moses, of the Israelites from the land of Egypt. Having multiplied in the land of Goshen, the Israelites were enslaved and oppressed in various ways by a "new king" who "knew not Joseph." Alarmed at their increase, he determined to prevent their becoming strong enough to act decisively against Egypt in case of war. Moses, who after various vicissitudes had been summoned from Midian to demand his people's freedom "to depart and serve Yhwh," and had brought ten Plagues upon the king and his people, was finally bidden by Pharaoh to lead the Hebrews out of the death-ridden land. More than six hundred thousand able-bodied men, not counting women and children and the "mixed multitude," with their cattle and other property, marched out in one night from Rameses in the direction of Succoth (Ex. xii. 37, 38; xxxviii. 26; Num. i. 46, ii. 32, xi. 21, xii. 37, xxvi. 51); then, leaving this latter station, they encamped at Etham, at the edge of the desert. For God had resolved not to conduct them along the nearer route, "the road of the Philistine" (Ex. xiii. 17, Hebr. ), fearing they might regret and retreat to Egypt when war (against the Philistines) became necessary. So Yhwh commanded Moses to lead them back and encamp before Pi-hahiroth, "between Migdol and the [Red] sea" (Ex. xiv. 2). This retrogressive movement would encourage Pharaoh to pursue the fugitives. The Egyptian king, in fact, starts out with horse and 600 chariots and a vast army to recapture the Israelites. He comes upon them "at Pi-hahiroth before Baal-zephon" (Ex. xiv. 9). Terrified, the Israelites cry out to Yhwh, and reproach Moses for having brought them there to die, though graves in plenty might have been found in Egypt. Then the help of Yhwh is miraculously manifested. They pass dry-shod over the sea, which divided at the lifting of Moses'staff and the blowing of a strong east wind. The Egyptians, thrown into confusion by a change in the position of the "angel of God," pursue after them, but the returning waters sweep their king and all his hosts to a watery grave (Ex. xiv., xv.). That the events narrated in Exodus can not be historical in all their details has been generally conceded. The numbers are certainly fanciful: 600,000 men would represent a total of at least two million souls. Where these could have found room and subsistence in the land of Goshen, granted even that many of them lived in Pharaoh's capital, or in the district of Rameses (Gen. xlv. 10, 18; xlvii. 11), and how so vast an unorganized host could have crossed the Red Sea in one night are questions that have not been explained (Colenso, "The Pentateuch," i. 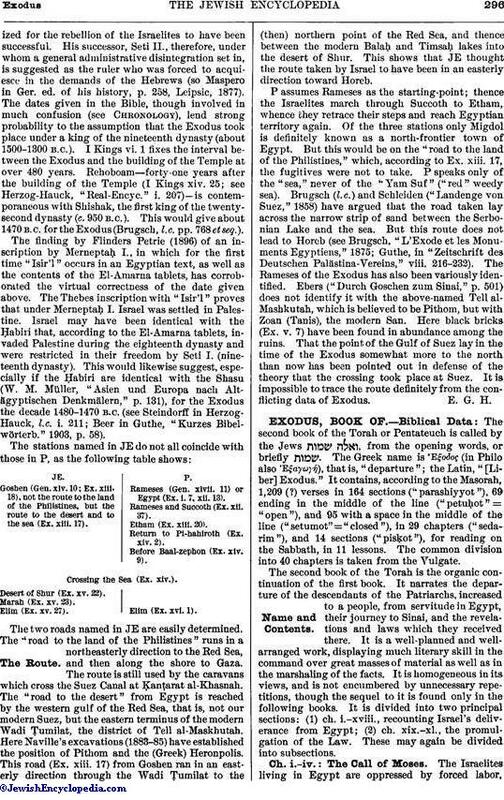 1867; Kuenen, "Historisch-Kritische Einleitung in die Bücher des Alten Testaments," i. 1,44 et seq.). The Exodus must have been a movement of a much smaller body of men. To doubt, as has been done by Winckler, for instance ("Gesch. Israels in Einzeldarstellungen," i. 55), the historical possibility of such a movement on the assumption that a confusion has arisen in Hebrew traditions between "Miẓraim" (Egypt) and the "Muẓri," a North-Arabian tribe, is not reasonable. In view of the central character of the Exodus in all later Hebrew theology, such a denial is inadmissible. Egyptian monuments show that Semitic shepherd tribes settled in Egypt at various periods. Though the theory that the Hebrews are identical with the equestrian clan of the Aper is not tenable (Brugsch, "Gesch. Aegyptens Unter den Pharaonen," pp. 582-583), and though the Israelites are nowhere named on the Egyptian monuments as sojourning in Egypt, the historical character of their own traditions on their stay in the country can not well be questioned. But it is probable that only a part of the twelve tribes, the Joseph group (see the Joseph story in Genesis), had pushed so far south, while related clans (the Judah group) never left the Sinaitic peninsula (Stade, "Gesch. des Volkes Israels," pp. 128 et seq. ; idem, "Die Entstehung des Volkes Israel," 1897, p. 12). Oppressed and compelled to help build the frontier garrison cities devised to keep them in check and their kinsmen across the frontier at bay, the Israelites invoked and receivedaid from their free brethren, who banded themselves into a confederation and, under the leadership of a great man (Moses), succeeded in their patriotic enterprise. The Israelites Leaving Egypt and Crossing the Red Sea. Like all old races, the Israelites regarded their national struggle as a combat between their God and the god or gods of their enemies. In their victory they beheld the triumph of their all-powerful God, "a warrior" (Ex. xv. 3, Hebr. ), over Pharaoh. This stupendous struggle, which must have lasted for a lone time, gave the first permanent impulse toward the welding of all the sons of Israel into a nation, which Yhwh had brought out of Egypt to be His people (Ex. xv. 16). The total destruction of the Egyptian army with its king is also an exaggerated statement of the fact that the Egyptian frontier garrisons were defeated in the attempt to recapture the Israelites or impede their onward march. The "crossing of the Red Sea" has invited much rationalizing about ebbing tides and the effect of the east wind upon the waters. Some natural phenomenon probably underlies the account, as also that of theten plagues. But this phenomenon is the remote material of an old mythology, and it is rather the mythological construction of the phenomenon than the phenomenon itself that has been elaborated in the Biblical narratives (compare Rahab and Tehom [Tiamat; see Abyss], and the like). The song (Ex. xv.) is certainly older than the various prose accounts of the crossing. The story of the Exodus is not by one hand: both JE and P are distinguishable (see Exodus, Book of). Manetho (Josephus, "Contra Ap." i. 26-29) relates that a certain King Amenophis had banished a leprous and impure people to do hard labor in the quarries in eastern Egypt. Later, settled in the city of Avaris, they chose for their chief a Heliopolitan priest by the name of "Osarsiph," subsequently called "Moses." Rising in rebellion against Egypt, they were defeated by an Egyptian-Ethiopic army, the fugitives finding safety in the Arabian desert. Charemon (cited ibid. i. 32), with some variations, reiterates the foregoing account. According to Lysimachus (cited ibid. i. 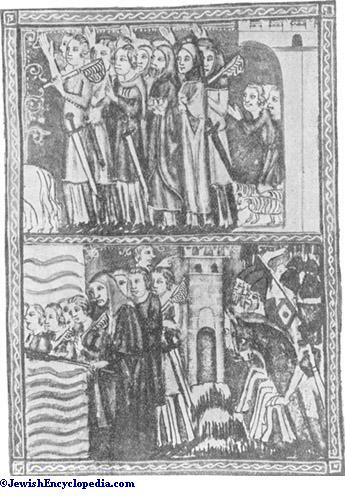 34), King Bocchoris drowned those of the Jews that were afflicted with leprosy and scabies, and drove the rest into the desert. These non-Jewish accounts are plainly inspired by hatred of the Jews, and display a strange mixture of blurred Biblical facts and free fiction. They are without value for fixing the date of the Exodus. 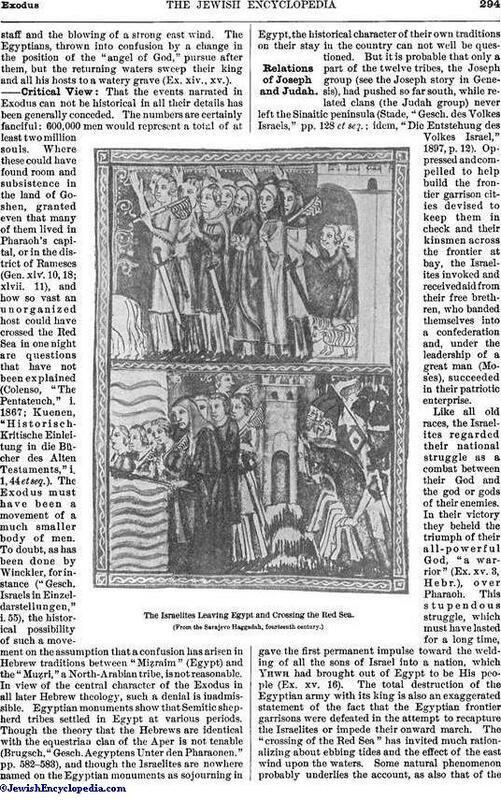 Up to within a very recent period the view which identified the Hebrews with the Hyksos (l.c. i. 14; Eusebius, "Hist. Eccl." i. 226 et seq. ), the shepherd kings of Aramean stock who held Egypt in subjection for some time (1800-1600 B.C. ), a view which Josephus was the first to urge, had been almost entirely abandoned. Most scholars identify with the Pharaoh of the oppression Rameses II., son of Seti, who ruled over Egypt for sixty-seven years. He is known to have built in Lower Egypt many structures of a character similar to those indicated by Ex. i. 11. One of the two Biblical "store [frontier] cities" (R. V.) recalls his name ("Ra'amses" in Hebr. ), and the inference is that it and Pithom, if not founded by him, were enlarged and beautified in his reign, especially if the Hebrew designation "'are miskenot" means "Temple cities" (Brugsch, l.c. p. 549). Merneptaḥ II., his son, would then be the Pharaoh of the Exodus, who, indeed, is reported to have had trouble with the hostile shepherd tribes across the border (the Shasu = Hyksos, the princes of the Shasu), and might thus well have attempted to prevent the contingency feared in Ex. i. 10, that the Israelites would "join also unto our [Egypt's] enemies." Still it has been argued that under the reign of Merneptaḥ II. Egypt was too well organizedfor the rebellion of the Israelites to have been successful. His successor, Seti II, therefore, under whom a general administrative disintegration set in, is suggested as the ruler who was forced to acquiesce in the demands of the Hebrews (so Maspero in Ger. ed. of his history, p. 258, Leipsic, 1877). 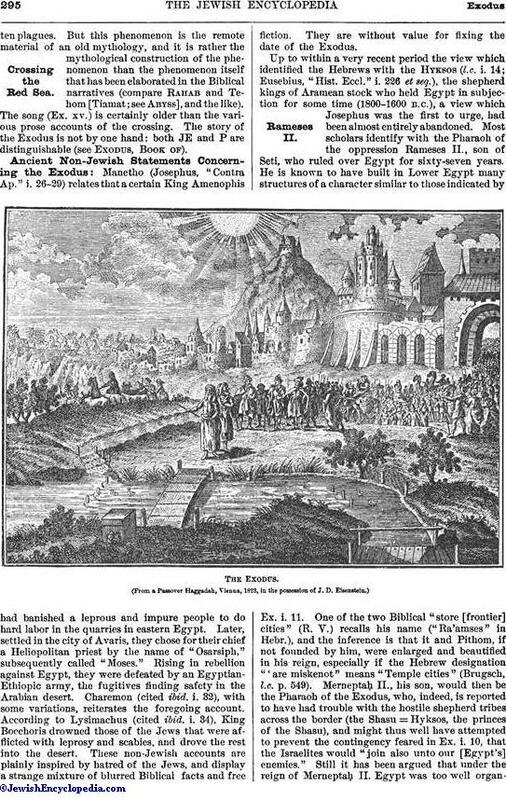 The dates given in the Bible, though involved in much confusion (see Chronology), lend strong probability to the assumption that the Exodus took place under a king of the nineteenth dynasty (about 1500-1300 B.C.). I Kings vi. 1 fixes the interval between the Exodus and the building of the Temple at over 480 years. 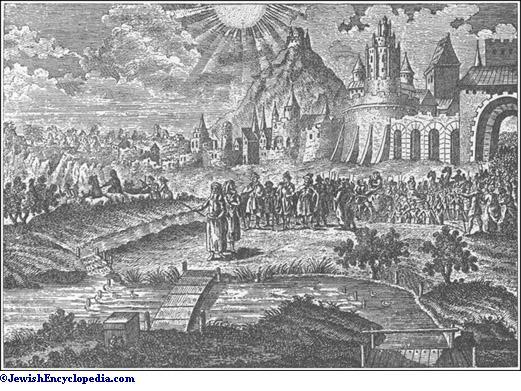 Rehoboam—forty-one years after the building of the Temple (I Kings xiv. 25; see Herzog-Hauck, "Real-Encyc." i. 207)—is contemporaneous with Shishak, the first king of the twenty-second dynasty (c. 950 B.C.). This would give about 1470 B.C. for the Exodus (Brugsch, l.c. pp. 768 et seq.). The finding by Flinders Petrie (1896) of an inscription by Merneptaḥ I., in which for the first time "Isir'l" occurs in an Egyptian text, as well as the contents of the El-Amarna tablets, has corroborated the virtual correctness of the date given above. The Thebes inscription with "Isir'l" proves that under Merneptaḥ I. Israel was settled in Palestine. Israel may have been identical with the Ḥabiri that, according to the El-Amarna tablets, invaded Palestine during the eighteenth dynasty and were restricted in their freedom by Seti I. (nineteenth dynasty). This would likewise suggest, especially if the Ḥabiri are identical with the Shasu (W. M. Müller, "Asien und Europa nach Altägyptischen Denkmälern," p. 131), for the Exodus the decade 1480-1470 B.C. (see Steindorff in Herzog-Hauck, l.c. i. 211; Beer in Guthe, "Kurzes Bibelwörterb." 1903, p. 58). Goshen (Gen. xlv. 10; Ex. xiii. 18), not the route to the land of the Philistines, but the route to the desert and to the sea (Ex. xiii. 17). Rameses (Gen. xlvii. 11) or Egypt (Ex. i. 7, xii. 13). Rameses and Succoth (Ex. xii. 37). Return to Pi-hahiroth (Ex. xiv. 2). Before Baal-zephon (Ex. xiv. 9). Crossing the Sea (Ex. xiv.). Desert of Shur (Ex. xv. 22). Elim (Ex. xv. 27). Elim (Ex. xvi. 1). The two roads named in JE are easily determined. The "road to the land of the Philistines" runs in a northeasterly direction to the Red Sea, and then along the shore to Gaza. The route is still used by the caravans which cross the Suez Canal at Ḳanṭarat al-Khasnah. The "road to the desert" from Egypt is reached by the western gulf of the Red Sea, that is, not our modern Suez, but the eastern terminus of the modern Wadi Ṭumilat, the district of Tell al-Maskhutah. Here Naville's excavations (1883-85) have established the position of Pithom and the (Greek) Heronpolis. This road (Ex. xiii. 17) from Goshen ran in an easterly direction through the Wadi Ṭumilat to the (then) northern point of the Red Sea, and thence between the modern Balaḥ and Timsaḥ lakes into the desert of Shur. This shows that JE thought the route taken by Israel to have been in an easterly direction toward Horeb. P assumes Rameses as the starting-point; thence the Israelites march through Succoth to Etham, whence they retrace their steps and reach Egyptian territory again. Of the three stations only Migdol is definitely known as a north-frontier town of Egypt. But this would be on the "road to the land of the Philistines," which, according to Ex. xiii. 17, the fugitives were not to take. P speaks only of the "sea," never of the "Yam Suf" ("red" weedy sea). Brugsch (l.c.) and Schleiden ("Landenge von Suez," 1858) have argued that the road taken lay across the narrow strip of sand between the Serbonian Lake and the sea. But this route does not lead to Horeb (see Brugsch, "L'Exode et les Monuments Egyptiens," 1875; Guthe, in "Zeitschrift des Deutschen Palästina-Vereins," viii. 216-232). The Rameses of the Exodus has also been variously identified. 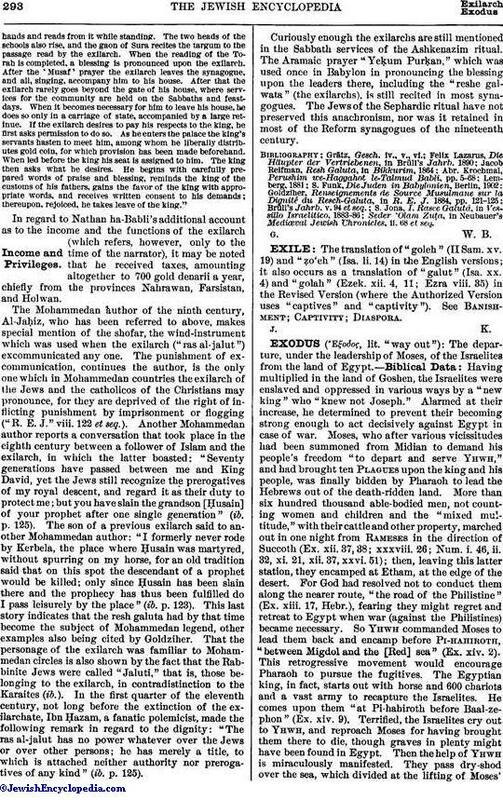 Ebers ("Durch Goschen zum Sinai," p. 501) does not identify it with the above-named Tell al-Mashkutah, which is believed to be Pithom, but with Zoan (Tanis), the modern San. Here black bricks (Ex. v. 7) have been found in abundance among the ruins. That the point of the Gulf of Suez lay in the time of the Exodus somewhat more to the north than now has been pointed out in defense of the theory that the crossing took place at Suez. It is impossible to trace the route definitely from the conflicting data of Exodus.